Yesterday, I began my rating of the drivers in 2008 with the lower ten, taking into account their records in previous years. Most of the comments were favorable with minor adjustments here and there, which surprised me somewhat as I thought I had been fairly controversial. It is in looking at the top ten in the cold light of another morning that I realize all the controversy is in this bunch - yesterday's post was tame by comparison. It is my assessment, however, and I stick with it, even the couple of names that I am going to be told are completely misplaced. This is the kind of thing that could be argued forever and I have my reasons, as well as biases. So, without further ado, here are the top ten drivers of 2008 in my opinion. As before, I begin at the lower end and work upwards. 10 Heikki Kovalainen. Heikki was very difficult to place; he is under a cloud with most fans at the moment, having underperformed this season, but we should remember that his retirements have been mechanical, rather than the result of mistakes. His luck has been awful and, while this counts as a part of any driver's credentials, I am not going to condemn him for failures of the McLaren. More worrying is the feeling that Heikki does not compete very strongly. He has been quick on occasion but has not converted this into strong drives for the top places. It is up to him to prove to us next year that he can race when the car holds together. 9 Nico Rosberg. I think Nico has slipped down everyone's list this season, largely because we expected better results after the Williams FW30 showed so well in winter testing. He has been inconsistent, at times competitive and at others lost in the midfield. The mistakes are almost certainly the result of frustration at not being able to make the car fast enough, which I can forgive him this time. It is his 2007 performance that keeps him in the top ten but he needs to do better next year if his reputation for speed is to survive. 8 Felipe Massa. Remember that this is an assessment that tries to take each driver's F1 career into the reckoning. Felipe has had a good year, nearly making it to the championship, but his erratic results, especially in previous years, hold him back from the top flight. We have all seen that Felipe can be very quick when everything is right - it is when the pressure comes on that he becomes suspect. Shout at me if you will, but I think all of the drivers I have placed above him would have done better with the car that Felipe had this season. 7 Mark Webber. Yes, I still believe in the Australian phenomenon that is Mark Webber. He has done wonders in inferior machinery all his F1 career, beaten now-illustrious team mates, and still he does not have the car to prove himself one of the best. The Red Bull RBR4 has been getting better, even if over-shadowed by the superior power of its sister cars in the latter part of the year, and Mark has been the one to take it as far up the grid as it can go. Give Mark the car to win and he will do so. 6 Sebastian Vettel. Many would put der Seb higher than sixth, I know, but I think there are still too many questions hanging over him. His win at Monza was first class, without a mistake or even a wobble, but he was never seriously challenged - the STR3 was that good in the wet. Let us not forget that Bourdais qualified in fourth for that race and would probably have been on the podium, if not forced to start from the back thanks to mechanical problems - and how good is Bourdais? We just do not know and so I cannot justify putting Vettel any higher than this. Next year will tell. 5 Kimi Raikkonen. Yes, he has come down in my estimation. All season I have had doubts about his reputation and they have not been answered yet. By his own admission, he lacked motivation this year and that sums up Kimi's unreliability - sometimes he is brilliant, sometimes merely present. To me, his series of fastest laps merely show how little he was interested in applying himself all race long and he needs to put in a season of Alonso-like consistency if he wants me to call him the fastest guy in F1 again. 4 Robert Kubica. Robert was impressive this year, getting to grips with the difficult BMW F1.08 early on and troubling the front runners enough to have them looking over their shoulders. He made only one mistake all season and his win in Canada may have been lucky but was deserved through his consistent pace. The only arguments I can see coming are the ones over why I place his team mate above him in this list - so let's get to that. 3 Nick Heidfeld. Okay, I am as surprised as you are that I still rate Nick so highly after a year in which he struggled with the handling of his car. It would be easy to look at Kubica's performance and say that he blew Nick away but I do not think it is as simple as that. Nick's problems were in qualifying - in the races he generally overcame the disadvantage of a poor grid position to pick up the points in the end. And he worked without public complaint to solve his problems, in contrast to Kubica's annoyance when things went wrong towards the end of the season. Then we saw the boot on the other foot and the question must arise: which of the two is more likely to make the best of adverse circumstances? The matter of speed is undecided as well, Nick being the quicker in 2007, Robert this time around - until the end. For me, the last two races resolved their final ratings with Nick marginally ahead. Next year may prove me wrong, if it will. 2 Fernando Alonso. These last two you can swap around and I will still be happy - they are impossible to separate. Fernando has been a joy to watch in an uncompetitive car, always ferociously prepared to give it a go and finally breaking through to win a couple near the end of the season. This is what the best are made of, that urge to compete in whatever machinery they are given and the will to motivate the whole team. Fernando is one of the top two drivers in the world and the only problem is that he knows it. 1 Lewis Hamilton. It's that man again. You may say he has made some silly mistakes but it all goes to the learning process - this is only his second year in F1, after all, and already he is the yardstick by which we measure the rest. He is like Alonso in that he never gives up and his car control is sublime; the superlatives are easy when talking of his driving. I give him top spot for two reasons, primarily because he has had to battle against some of the strangest stewarding decisions in the history of the sport, without which he would have been champion much earlier, and because he has risen to be the only competition for Alonso in so short a time. The promise and potential are obvious. Kovalainen: rubbish compared to Hamilton. Very few good races this year, but not too many mistakes. Bad luck and lack of talent combined IMO. Somebody said that Button is probably the most overrated driver in F1 today. I would say that Webber could get the second place :) IMO he is just as good as Trulli, but had a better season this year, probably the best ever for him. Heidfeld and Kubica had a very similar season, but I've put them lower than you because I believe that they would have less points (and their result would not be that amazing) if the top conteders didn't commit so many mistakes. Hamilton: he made a lot of silly mistakes - I would put Montreal at the same league of Silvertone for Massa - and almost thrown away another championship. I wouldn't say that he progressed compared to last season, maybe only a little bit. He learned something from '07, but not as much as I was expecting. He definetely deserved the championship, is one of the greatest drivers around, but he is not the one (yet). Vettel: fantastic season. He is the only one (besides Alonso), that given the car could beat Hamilton or any of the Ferrari drivers. I believe he will make Webber think about retirement next year :) He is good in dry weather and is even better in wet weather. I hope to see him in a top team in a very short time. Alonso: after a poor start of the season due to unreliability and him outdriving the car, when he managed to score points regularly, he showed the spark is still there. His two wins were fantastic. To me he is by far the best driver around. I think the two drivers we disagree most on are Massa and Vettel, Filipe. Vettel is too new to the game to give him as high as second place, really. Sure he's had a few good races but he has also been pretty average in others. Too much depends on how good that Toro Rosso is - and that is very hard to assess since Vettel's team mate is also a rookie. What we do know is that the STR3 is very good in the wet and Vettel made good use of it when it rained. I will wait before moving him up the list, however. As for Massa, I don't know why I don't rate him as highly as you do. I can think of excuses but really it's just a nagging doubt that his performance since the arrival of Kimi has been entirely due to Felipe. Maybe I suspect that Ferrari are giving him a lot of attention and help as well as a very good car that suits Felipe but not Kimi. It's hard to explain and you may well be right that he is better than I think. I decided to wait until you completed your list before I commented. The bulk of the list I am in broad agreement with but there are a few I would argue. It looks like some drivers have been rated on the season while others have been rated on their whole careers. DC based on his career cannot be in the position you placed him. That makes no sense. I am glad to see you choice for number one and I am sure you will not be surprised to hear that I agree with it. I think you have been harsh on Massa. How can you rate him below Webber. Webber has not shown anything that would suggest he could challenge for a championship. I disagree too with Felipe's point that Hamilton's mistake at Montreal can be compared to Massa at Silverstone. Lewis made one mistake in Montreal at a time when his rythm and concentration had been broken whereas Massa had five separate spins at racing speed. I accept the Ferrari is a pig in the wet but his team mate didn't have the same problems. I also don't think Vettel can be rated higher than Massa. Vettel put in some impressive drives but he was not under the pressure that Hamilton or Massa were. I can only say... congrats man. Hats off. I'm really near of a list that shows tons of knowledge, good judgement and fair play. 1. What Kovalainen has done this year is really dissapointing. Maybe he taking care not being too fast to be treated as a threat for Hamilton :-), or maybe he was doing it as slow as he can to be sure he can't do it worst next year. 2. You're wise being cautious about Vettel. He has shown quality.... how much, we don't know. I couldn't feel all that hype when Alonso was the youngest poleman (Malasia) and the youngest winner (Hungary), while it took him two races to show his credentials. Instead, giving a not so poor rating to Bourdais shows me that you have pay attention to whole of the pack. This guy did put some nice performance that only bad luck made him earn nothing. 3. Maybe Massa could have been given a better rating. Yes, his first seasons were, ejem, horrible?. But last season he showed class. This one, nor a silly error (and it has to be valuable, given the high number of them we could saw), neither a lack of competitiveness. 4. I'm with you. It will take Kimi more than a bunch of fastest laps to gain my respect again. You can't loose motivation riding in a Ferrari. Did Alonso let him fall down like that last year? I think this is the equation of what we will expect about Formula 1 next years. Nothing more,,,,, but nothing less. I can't remember such a pair of equals riding to be the very best. Just to remember... Prost-Lauda? noooo. Senna-Prost?.... maybe, but I finally rate Senna as much better (and I hated him soooo much....), Schumacher-Senna? that could have been, but we will never know. Schu-Hill? come on (And I wanted Hill to crush that ugly german). Schu-Hakkinen? Schu was on his own league. Maybe, for what I could read, a Fangio-Moss would have been similar. But I couldn't watch it, no way. So, one more time. I liked it very much. Steven: I tried very hard to look at each driver over his whole career but it is inevitable that the freshest memories come from the last year or two. Remember, too, that many of today's drivers have only one or two years in the sport to judge them by! On Webber and Massa we are going to have to agree to disagree. I think Webber has more speed, stamina and guts than Massa and he gets results even in bad cars. When Massa had rubbish to drive, he tended to throw it at the scenery in his attempts to make up for it. Okay, Felipe has learned from the master and is a much better driver now. But better than Webber? Hah, put Webber in that Ferrari and you'd see how good it really was. Vettel gets the benefit of the doubt from me because his drives in the final races were so assured and error-free. He looks the business in the car and, even though I hate to admit it, this is one occasion where the majority will be proved right, methinks - the gawky Vettel is a star of the future. Roger: Thank you for the kind comments. And I agree with your look at previous struggles between equals - they weren't equal at all. Senna was well above the level of the rest and I think Schumacher was as well (although I hate to admit it). Hakkinen came closest, probably, but I would have loved to see Frentzen in a decent car and a team that supported him in his contest with Michael. Well I for one agree with your placing of Massa, in fact I'd probably rank him even lower ! I have always thought of him as a mediocre driver in a good car, and despite his result this year nothing I have seen changes that opinion. Others could and would have done so much more in that car. Wich is one reason why I don't want Fernando to go to Ferrari (ok, the main one is because I hate them) but I think it would be a return to the boring dominance of one driver - although I guess this time around we'd have Hamilton rattling the cage a bit. I think you underrate Massa. You say stewards decisions cost Hamilton the chance to wrap up the WDC early, Well if the usually reliable Ferrari engine doesn't blow up in Hungary (where Massa made an erxcellent pass to take the lead and never looked back) and Ferrari doesn't make a stupid pit error in Singapore, Massa has the WDC locked up early. I think that's true even if you give Hammy back the points the stewards cost him. (I'm sure Ali can do the math if I'm wrong :-) ). I'm not a Massa fan but he drove well and occasionally brilliantly (Turkey and Brazil). Hamilton is a deserving champion, but I still put Alonso 1st. 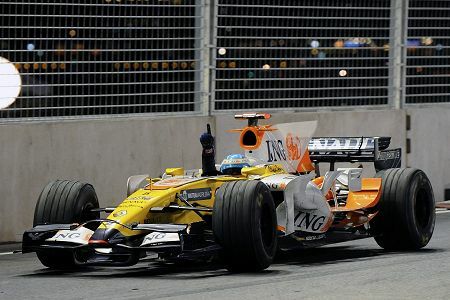 Hamilton started out with a great car and nearly wasted it, Alonso took a bad car by the scruff of the neck and with plenty of help from Renault I'm sure, dragged it to the front. I wonder if any other driver could have done the same? And I agree with those who say you have a large blind spot about Webber. I like him, but he hasn't been able to do anything with the RBR and I doubt he would do more in a better car. I think one factor I'm putting in to my list below is that I'm rating them based on how well they did with what they got. So with the Webber-Massa example, I'm not going to speculate on how well Webber and Massa would do if they swapped seats. I'm rating them based on how well they did given the current situation. For simplicity's sake, I'll just rank the top 10. I agree with Clive's contents, anyway: it's just the order that I'm disagreeing with. Yup, I'm putting Massa way up there, just below Lewis. Why so? Well, let's consider his environment. The F2008 just didn't seem as well-balanced as the F2007 did, especially in the 2nd half of the year. Meanwhile, his teammate was the defending champion! So Massa had a pretty uphill battle. True, there were some odd calls from the stewards that helped him out, but it wouldn't be of any use to him if he wasn't fast enough to challenge and beat Lewis. Now, why am I ranking Massa above the others, especially Alonso and Kubica? Well, because Massa has been on form all season, bar the first 2 races and Silverstone. He was always able to collect points on days he wasn't the fastest guy, like Monaco, for example. That remarkable consistency also helped to keep him in the title hunt to the very end. Alonso and Kubica, on the other hand, seemed to have too many off-days, or days where they just didn't seem to bother. This usually happened when their cars just weren't up to the challenge. For Kubica, look at how his season went off the boil at the end. True, part of that could be blamed at BMW's decision not to gun for 2008, but still, Robert was getting beat by Nick in the 2nd half of the year, which given his talent, shouldn't have been happening. Alonso is the complete opposite. While he ended 2008 on a high, the start and middle of his year was not as impressive. Sure, he was scoring points relatively regularly in a dog of a car, but there were days where he was either pushing too hard or not pushing at all (see Monaco, Canada, France - where Piquet passed him, Britain, and Germany). But still, getting 2 wins out of that car was very impressive, therefore his P3 on my list. Just a question, Clive: why is Kimi ahead of Felipe in your list? That just doesn't make sense to me. Sure, Kimi had a whole basket of FLs, but he wasn't able to take full advantage of them due to iffy qualifying and some brain fade moments, like Singapore, and to a lesser extent, belgium. I would've ranked Nick higher if he had won. Robert managed to in Canada (albeit thanks to some luck), but Nick hasn't managed it. Surely, you can't just blame bad luck for Nick's winless streak? Lonny: Sometimes when I'm watching a GP, I wonder if Ferrari has an engine destruct button in the pits that they press when it suits them - as in Massa's engine failure three laps from the end in Hungary (complicated reasons why it suited them - conspiracy theories and the like). Now, if they had such a button, then I would agree that Massa's mechanical failures would balance out the stewards' decisions against Hamilton. It's all about deliberate intervention, you see. Any driver takes his chances with the reliability of his car - it's part of racing. But a driver who is held back by points deductions at crucial moments in the championship has a right to complain, unless those deductions were deserved. And I don't think Hamilton's were in the second half of the season - they amounted to race fixing by the officials. No argument about Alonso - as I said, he and Hamilton are almost impossible to separate for the first two places. But as regards Webber, I want to see him in a decent car before he gets too old. If he fails to provide the goods then, I will own myself beaten. I started doing the maths, but found it was too long to work as a comment, so I put the equations in my blog instead. The result of calculating using the bad luck of both (in the form of dodgy stewarding, technical failures and the effects of others around them being given unfair treatment) is there. It suggests that Massa would have been three points further behind Hamilton had they been taken fully into account. Journeyer: Why do I rank Raikkonen above Massa? Mainly because of Kimi's previous record - I have not forgotten (yet) his McLaren days when he carried the fight to Schumacher and Alonso. In those days we all thought he was the fastest guy alive and it is only since he went to Ferrari that he has begun to slip from the top of the list. So he is on his way downwards but still just edges Massa in my book. If I were looking at the 2008 season in isolation, yes, Massa would be ahead of Raikkonen (and much higher in the list too). And so to Nick's winless streak. Keith Collantine loves a winner and wants a points system based on wins more than race positions; I am more in favour of keeping things pretty much as they are because the present system rewards reliability as well as pure speed. I hesitate to mention Chris Amon at this point, for fear of jinxing Nick, but in the late sixties and seventies I rated the New Zealander higher than anyone else - and he famously never won a GP. Nick does bear some resemblance to Amon, especially in his clutch of second place finishes but no win, but he has a more patient attitude. As his record demonstrates, he knows how to race and to finish; if BMW give him a potentially race-winning car, he will get the job done, I'm sure. Robert has a win, a lucky one as you say, but a win nevertheless. Let us not forget, however, that it could just as easily have been Nick's, had his tyre strategy been a little different - and he did move over for Robert, putting the team first. One more historical factor to consider: In the late seventies, Williams produced a race-winning car at last - the FW07. Alan Jones had been with them for a while and had been instrumental in developing the car into the world beater it became; he was also quicker than his team mate and we all knew it would not be long before Alan won Williams' first GP for them. In the event, however, it was Reggazoni who did the deed (much to Alan's frustration) and he will forever be in the record books as the guy who achieved Williams' breakthrough to the big time. But from then on, it was all Jones and Regga never won another race. I am not saying that is exactly comparable to the situation at BMW but it is something to bear in mind, especially as this matter of breakthroughs achieved by second drivers seems to happen fairly often. And Nick better reward my faith in him next year or he gets the boot! I didn't the maths, but I cannot agree to give two further points to Hamilton on Singapur, because of the delay on the Rosberg penalty. Absolutely. The penalty was given in form and place. Hamilton -2 and let's see how it ended. And I would add that maybe some points would have been given to Massa if we discount the harsh penalty he suffered!!!! Clive, yes this time your bias show more (which is pretty ok by me). I wouldn't rank Nick this high, but I agree that he was the most underrated driver of the season. People keep saying how Kubica was destrying him and that BMW would drop him, but post Monaco he performed pretty much on the same pace as Kubica. He did have probably in qualifying throughout the whole season, but unlike Kimi he usually climb positions in the race. And he might not have a win but he scored more podium than Kovalainen or Alonso. As I already mention, I'd have both Toyota guys in the top 10 in place of Kovalainnen and Rosberg. I'd have ahead of Webber as well, but is hard to really acess Webber's performance this year. DC was so off his usual standards that is hard to try to compare them. Webber first half of the season was probably his best, but them things start to go very wrong after the front row in Silverstone. Why did Red Bull drop this much in the second part of the season remains a big mistery (I don't think it's the engine given Renault strong showing) and Webber likely had little to do with it. I think Massa's season has been very overrated by some, his great breaktrough season actually had him score three more points than 2007 with one extra race and he mostly win in his usual places plus new track Valencia and a couple of other wins (Spa, Magny Cours) that were due to other drivers problems. And this dispite McLaren being down one driver, Alonso having an awful car for two thirds of the season and his partner being "Kimi the zombie". He had some very strong moments (like Hungary) and some bad luck, but he has also quite a few awful or mediocre races. I think his main problem is not that he doesn't drive well under pressure (I actually think he does well when put in that position), but that he get very lazy if things are going to well or to badly. For example, he lost the title by one point, right? There were two times this season where Lewis overtake him almost like he was a backmarker. The first in Turkey where Lewis was in a three-stop strategy, Massa knew he would win the race anyway so he let Lewis pass without a fight, if he had put a strong fight Kimi would have likely being second after Lewis pit. It would be harder in Hockenheim as McLaren was clearly very superior but again Massa act like there were no point on him try to defend his position, if he had tried more maybe Piquet could have enough lead to at least believe that he copuld win. And there were other races like Monza were the seems to have set for mediocre very easily. The less said for Kimi the better, I guess he wants to keep his track record of following a strong season with an off-year. Don't blame Vettel for what happened to Speed. The kid is really good and he was already having a very strong season before the STR3 improve post the late summer break. I have little to add on Hamilton, Kubica and Alonso. Roger, penalties are supposed to be given out as soon as the infraction is noticed and agreed precisely in order to limit the advantage that can be gained from it being unnecessarily elongated. The penalty was an easy one to assess and yet it took ages for it to be given. Rosberg benefited a lot from it (as did Kubica; contrast with the almost-immediate penalty for Massa for an incident that was only slightly later and, if anything, more difficult to assess for justification). Therefore it is as fair to correct for bad stewarding there as it is to correct for other bad stewarding decisions in the season. I don't see how Massa would have scored more than one point in Singapore had there been no pit lane incident. My reckoning is that had the pit stop occurred correctly, he'd have come out 10 seconds ahead of Raikkonen. Raikkonen was in 16th after emerging from the pits. 10 seconds ahead of him would have put Massa 10th at the end of the first safety car. He would have gained two places due to the way he performed after the Safety Car came in, hence his eventual net position of 8th. I assumed that a safe release would have occurred, otherwise he wouldn't even have had the one point from Singapore in the revised count. Filipe: I don't blame Vettel for what happened to Speed - just been waiting to see how he would do. And we're beginning to see how good he is. In another year, I think we will have a much better idea of how he compares to drivers like Hamilton, Alonso and Kubica. Alianora, one can't really use Kimi's pit as basis for Massa's, thanks to the whole mess Ferrari lost some time before fueling Kimi. Massa would have come either just ahead or just behind Hamilton (I'd say just behind given that Hamilton did the second pit earlier and McLaren must have fueled him lightly to try to come ahead) and I don't think one can use Massa's post-pit performance as basis for what his performance would be. But that just show how impossible is to truly do this kind of speculation (I know uit was not your idea) as there's no point in really believe the remaing race would play exactly like it did. For example, if McLaren gamble of fueling Lewis lightly didn't pay off (which is impossible to truly know) and he ended behind Massa there's a genuine shot that his race would be ruined if Massa got stucked behind DC waiting to get the position in the second pit (in the actual race he did a couple of faster laps after overtaking DC and just barely came out of the pits ahead of Trulli). And then there's the fact that the nail-baiter finale in Interlagos was predicted in Lewis and McLaren been playing very safe in the final race, if Massa had come to São Paulo closer, it is obvious that Lewis whole weekend would have being much different. Clive, the Speed/Vettel commentary was intended as a joke, sorry if it come out the other way, when one is writing in another language it's harder to suggest that. How would f.ex. Button, Glock and Trulli do in a McLaren compared to Kovalainen. I think they could match him, so I don't have him so high on my list. I also have Webber and Heidfield lower on my list. You have made your list not just from this season, with this in mind, I think Kimi should be higher. It was not his season, I admit it, but if you think back on what he have done earlier then he should still be in top 3. Besides that I am agree with Massa, Vettel, Kubica and the rest your list Clive. I'd assumed Raikkonen's pitstop was normal. Felipe is correct to say that this is an incorrect assumption. If you use the position relative to Sutil as a guide, he ends up sixth. So there would be cause to give him two extra points. However, this still leaves him two behind Hamilton. I was concentrating on the quantifiable stuff, and also avoiding speculation on certain cases of good luck (I came close to taking 10 points off Hamilton in Monaco as I think he was very lucky to drive away from the early crash he had there - now that would have changed the equation a whole load). Felipe has explained why better than I could. Could not agree more with your top two. Although I dislike Alonso enormously I have to admit he is a great driver and Hamilton is possibly the most skilled driver I have ever seen. Lets hope Renault are better next season so we can see them both race properly. Lets also hope that the Stewards then let the race properly. Imagine if the real Kimi turns up next season too and the racing that this will produce between the three of them.